USP Lewisburg, Special Management Unit: How America’s model prison became the most horrific facility in the federal system. A distant view of USP Lewisburg. Last month, I wrote about Marion, the notorious federal prison that helped pave the way for all the supermax-style facilities that are so popular today. Though Marion was under lockdown for an astounding 23 years, the prison itself became a medium-security facility in 2006, and is no longer a repository for the most troublesome prisoners in the federal system. That honor arguably now belongs to USP Lewisburg, a Pennsylvania facility where violent or obstreperous federal inmates get sent for ostensibly short-term “attitude adjustment” stints. (Before transferring out, inmates are expected to complete a four-stage, 18-to-24-month resocialization program that can actually last much longer than that.) USP Lewisburg might be the worst place in the federal prison system, so bad that some inmates there actually dream of being transferred to the famously isolating Supermax facility in Florence, Colo.
A recent article from the journal Environment and Planning D: Society and Space helps explain how Lewisburg got that way. The article, by Bucknell University geography professor Karen M. Morin, recounts the transformation of USP Lewisburg from a progressive facility to an isolating and restrictive “Special Management Unit,” or SMU—a shift that mirrors the evolution of the U.S. prison system in general. (Morin is also a member of the Lewisburg Prison Project, a nonprofit group that advocates for prisoners’ rights.) Whereas model prisons 75 years ago were designed to rehabilitate prisoners, the best-known prisons today seem specifically designed to drive their inmates mad. When it was built in 1932, Lewisburg exemplified a penal philosophy that, in Morin’s words, “stressed reform over retribution of the surging prison population of early-20th-century America.” The handsome hilltop complex resembled a college campus more than a typical prison, and, like college students, Lewisburg inmates were presented with a wide variety of activities with which to occupy their time. In a 1939 document, the Federal Bureau of Prisons noted that “in prison, all work and no play leads to brooding, plotting, perversions, and riots. Deprived of recreation even the normal individual becomes morose and irritable, his nerves dangerously on edge.” Lewisburg was built to sublimate those dangerous urges. Inmates could participate in a variety of sports, publish a prison newspaper, perform in plays at the prison auditorium, and farm their own crops—alfalfa, sorghum, soybeans, and more. Morin astutely notes that, during this era, there was likely a significant gap between how Lewisburg was supposed to work and how it actually worked. As time passed, the gap grew wider. The rehabilitative penal model fell out of fashion by the 1970s, and was further marginalized by the passage, in 1984, of the Sentencing Reform Act, which among other things abolished parole for federal prisoners and sent BOP facilities into a state of overcrowding that still exists today. Overcrowded prisons are violent and restive prisons, and corrections officials responded to the predictable surge in inmate violence with increasingly punitive tactics—throwing offenders into extended solitary confinement, implementing long-term lockdowns, and, eventually, creating dedicated supermax-style units and facilities to isolate troublemakers. Today, Lewisburg could not be more different than it was in 1932. The recreational facilities have fallen out of use; prisoners no longer grow their own sorghum. Instead, SMU inmates spend 23 hours per day confined to cells they share with a roommate; the cells are so small that both men cannot walk around at the same time. Lewisburg inmates soon learn that forced proximity to others can, in its way, be just as torturous as extended solitary confinement. Prison officials claim that cohabitation forces the inmates to learn how to “coexist” with other people. Great idea, in theory. In reality, Morin writes, the close quarters breed tension and violence. One of the many Lewisburg inmates whom she quotes writes, “Numerous acts of violence occur because people are frustrated by living in doubles [and] fights, assaults, suicides, and murders [result].” Another decries the “staff’s policy of refusing to intervene in cell fights and assaults by one cellmate on another cellmate.” If these and other reports are credible, Lewisburg’s two-to-a-cell policy is less an attempt to resocialize the inmates than a de facto invitation for the men to harm each other. 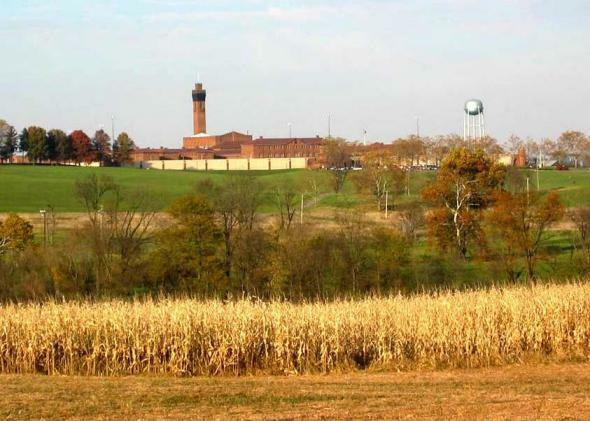 BOP officials have claimed that the very existence of a place like Lewisburg makes the rest of the federal prison system safer. But even if this is true, purchasing safety for the many by brutalizing a few is a devil’s bargain. The USP Lewisburg SMU represents a blunt, cynical answer to the question of what to do with the federal system’s most troublesome inmates: send them to a place that is so utterly horrible that, by the time they transfer out, they will do anything not to be sent back. (And if they never end up transferring out, well, at least they’re out of everyone else’s hair.) It is a solution unworthy of a civilized nation.